Following several highly-successful projects in SA Partnerships, we are increasingly being asked to run training for full-year projects as well as advanced training for Partnership Numeracy Coordinators or CPACs. We have limited space for Partnership Projects over the next 12 months, so have provided the following information for schools to consider. Step 1: Choose one area to focus on. This should be negotiated between schools, with a common focus chosen. A focus is important for gathering data and evaluating the effectiveness of the project. Also, if we need to create new resources for your partnership, then one area is easier to create. So far for our partnership projects we have created five books, a set online learning modules for teachers, a webinar series and a series of advice papers for leaders. Please note: Your Partnership will also need to nominate an Advanced Trainer, who will undertake an additional five day training course with Tierney Kennedy as well as additional mentoring and support for no cost. Step 2: Negotiate an appropriate starting date as well as follow up sessions and nominate your Advanced Trainer. We find that the most effective combination is to provide an initial two-day course, then one follow up day per term for the following three terms, combined with ongoing webinars. We suggest a 12 month project, with reports at the half-way point and the end. Webinars are important to access live, but recordings are also provided. In one of our projects we compared the student data from those schools using the webinars and those who had the same in-person training and resourcing, but not webinars. 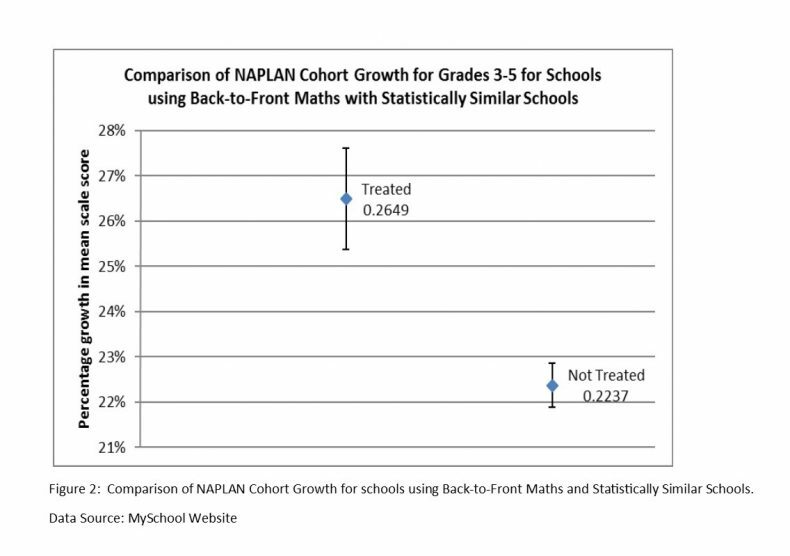 The effect size doubled (0.49 to 1.02 for Junior Primary, 0.41 to 0.88 for Primary), and so did the statistically signficant growth. We have therefore chosen to make webinar participation a compulsory part of future partnership projects. Student Data is also an important part of any projects that we run, because we believe that seeing real improvements are the only way to know that what we are doing is working. 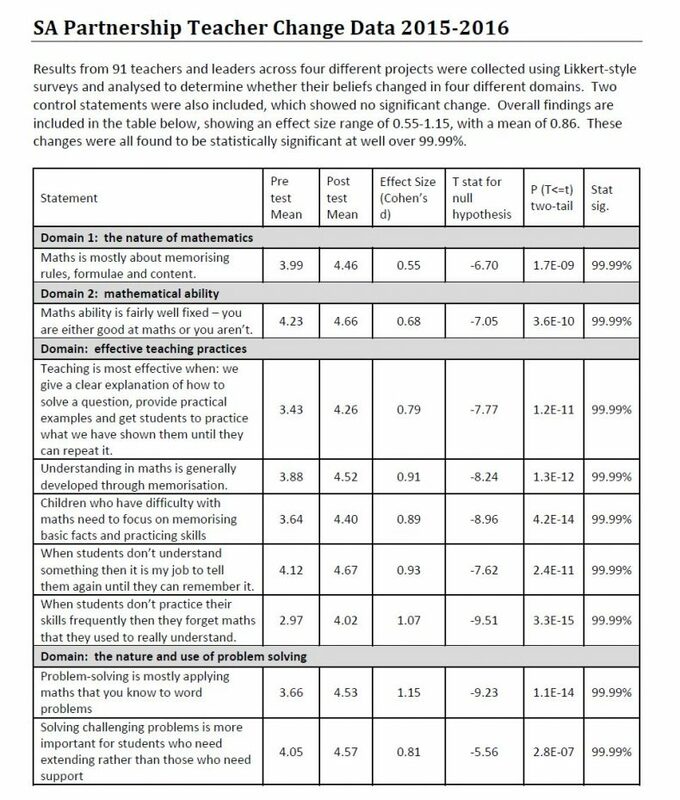 Any Partnerships that we work with therefore need to commit to using pre and post testing (including existing PAT and NAPLAN data, as well as diagnostic testing that we supply) to measure the effect size. Five-day advanced trainer course for your nominated CPAC or Partnership Coordinator (valued at $5000). This course is designed to up-skill an existing leader within your partnership, to support your schools in achieving significant growth in results within 12 months. Resources valued at $820/person: Each participant is supplied with online web access to Back-to-Front Maths ($250/person), a facilitator training manual ($80/person), a DVD to support your professional learning ($200), an Interventions book of your choice ($40/person) and access to 10 webinars for each teacher and and additional 2 for each Leader ($250). See sample webinars here. Total value: $32 800. Diagnostic testing to use with all classes, as well as spreadsheets for data analysis and calculating effect size. This data will be moderated and used throughout the project to check student improvements. Three live follow-up sessions with the project participants or project leaders in the next 12 months – these will be run by the advanced trainer and supported by Tierney Kennedy as much as needed. Valued at $9000. Two project reports for partnership Leaders, including teacher and student data (effect size calculations, statistical significance) Valued at $3 000. See example report here: Holdfast Partnership Final Report, November 2015. Useful additional tools and mentoring for leaders, including “How to analyse your NAPLAN Data” and “How to achieve whole school change”. Discounts on whole-school resourcing, webinars and in-person demonstrations. 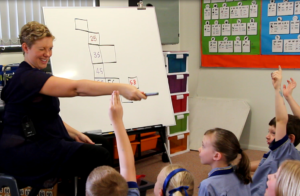 Fixed cost to your partnership: $39,500 for up to 40 teachers (includes GST, travel, ongoing mentoring and resources). Please note: Alternative options are available, including training only, resourcing only, online training only etc. The fixed price is also intended for whole Partnerships (6-15 schools) rather than individual schools, who want to not spend additional money on resources etc. and is based on the average amount that Partnership schools spend altogether over a 12 month period. Step 4: Contact Tierney Kennedy directly now by emailing tierney@kennedypress.com.au to arrange a time to talk through options so that we can work out what might suit you and your schools best. We are happy to suggest other consultants if we do not feel that we are the best people to help you achieve your partnership goals, or if we don’t have the time available.